What To Know About Bustling Your Dress. For brides that choose the long lace bustle or the shorter bustles that have the color coordinating loops to tie, here are some pieces of advise about preparing for your wedding day bustle. Yes, you actually have to prepare for this. You don’t want to be a bride stuck in a hot bathroom for 45 minutes right before dinner with a handful of girls arguing about how the bustle should be done. You need to be prepared because each bustle is different and can be very complex. When going for your last fitting. Make sure to take your maid/matron of honor with you or the person you feel can handle doing the bustle for you the night of. When trying on your dress you’ll look back at the seamstress while she effortlessly ties, snaps and pulls at your dress. She will say ‘its easy!’ just look for the color coordinated strings and pull tie and snap!”. Not so fast! Make sure your camera is out and on record when she shows you how the bustle is done. You’ll need that footage when the time comes. If your bustle partner can’t be there, have someone video it for you and send it to her to see and study. When your dress is at home, take 30 minutes to practice the bustle your self as well as with the person who will be helping you. You will be grateful later when your first dance song is around the corner and you only have 10 minutes to freshen up. Quick bustling saves time. If your bustle partner can’t attend this, have her practice the day before the wedding when she arrives. I know its hard to have everyone where you want them to be, especially when planning a destination wedding. 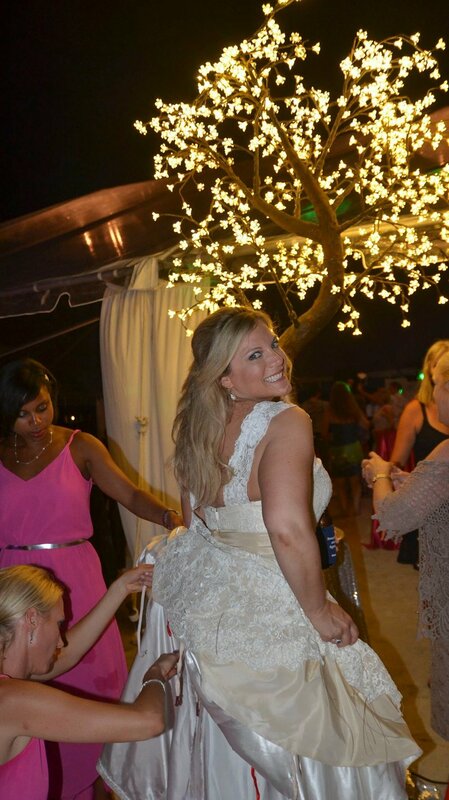 The person bustling will need a back up person to help hold the dress up and even help the bride freshen up. This can be your coordinator or a friend. Dont underestimate the team it takes to keep the bride happy and looking stunning at all times. If you have a complex bustle it would be wise to tell your coordinator this so she can schedule enough time for you to get ready for the next segway of the evening. You really don’t want to feel rushed and with the correct planning you wont. Try to communicate how much time it takes to get the bustle done so things can run on time. Blue Water Weddings loves this photo of an event we did when Carol bustled her dress on the beach in front of the light up cherry blossom tree. You can tell she has a great team around her keeping her happy and looking fab! Contact Blue Water Weddings for the guidance you need to plan your destination wedding in the Florida Keys. Serenity Cay, Islamorada Bayside Home. Stunning upscale wedding retreat.